The next few posts will be dedicated to frigid winters (with apologies to those who do not experience the winters that this Canadian writer does). Since it is uneconomical to buy a new coat/jacket/parka every winter, the best strategy is to accessorize. I'll start with my favourite winter accessory: the snood - think scarf joined at the ends to form a circle, which is pulled over the head, in the most simplistic short version or if a little longer, to go twice around. The more elaborate styles incorporate enough fabric for a "hood" that is pulled up from the back and then falls into a beautiful cowl neckline. I have seen them in faux and real fur, knitted or in woolen fabrics. Visit Swakdesigns.etsy.com for some beautiful hand-knitted snoods. 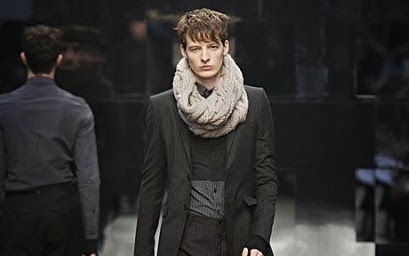 Burberry has shown the snood perennially for men and women in both solid colour cable knit and the classic Burberry plaid. This photograph is from 2009 however as stated they are a perennial winter fashion statement. 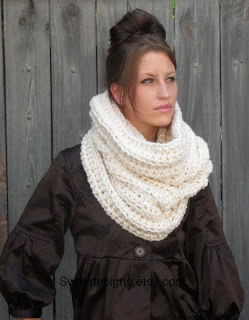 Men and women are both comfortable wearing snoods and there's just something about the way they crumple into a cowl around the neck that makes for a chic look. When choosing a snood, you need to consider proportion relative to the coat or jacket, style (long, short, simple, "hooded"), function ("hooded" or not) and of course, colour. I have accessorized my basic grey, brown and black coats and jackets with red but the baby blue as seen on the Brorablog is quite lovely and much more subtle than the red I chose. You can do exactly what this photograph demonstrates and that is to pick one of the more subtle colours in a tweed or plaid and match your winter accessories to it. As I look out the window and see the snow falling, I too am face with several months of Winter ahead. Winter can be a beautiful time of year if you dress for it. Since I often go out for hour long walks in the Winter a little dash of fashion might be nice. 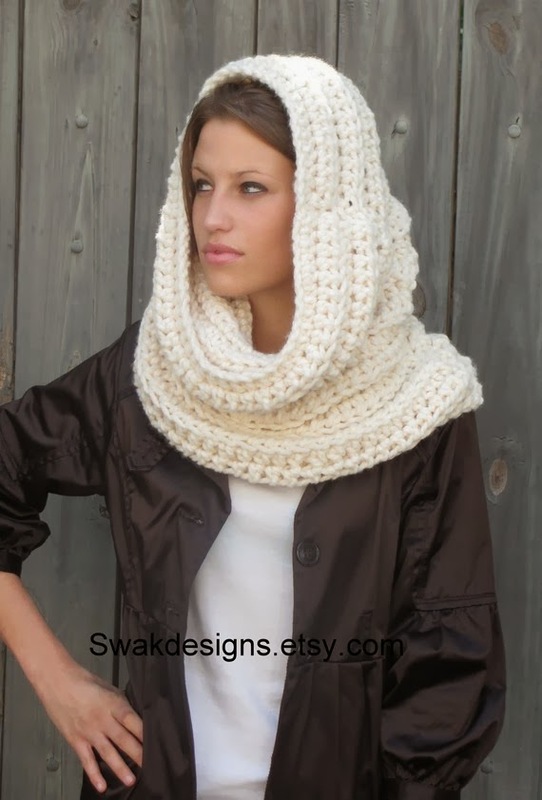 The "snood" would be perfect since it is fashionable and functional. I LOVING the baby blue one too. Nice to have you back commenting Brian. I can see you in a snood. This post is so timely! We just returned from shopping at Macy's in downtown Seattle where I bought a faux fur snood! And I love it!! My husband thinks I am crazy but no matter.....I know he is right!! I can hardly wait for it to get cold enough here to start wearing it. Welcome home. Keep up the good work. Always interesting reading for me!! Send me a photo so that I can update the post with a photo of your faux fur snood irrespective of what anyone else (husband's included) thinks.